I LOOOVE gangster films. From classics like Scarface to The Untouchables to old Black and White Noir films like The Public Enemy, Kiss of Death and White Heat, I can't get enough Gangster films. Though the story of Dillinger has been told before (and since), John Milius' Dillinger (recently released from Arrow Video) is one of the best, bloodiest and most realistic. Dillinger avoids any real back story about the legendary character before we see him and his gang start blowing people away. Warren Oates stars as the man himself, who goes on a bank robbing rampage in the 1930's with his gang of criminals including, Homer Van Meter (Harry Dean Stanton) and Harry Pierpoint (Geoffrey Lewis). They eventually meet up with Pretty Boy Floyd (Steve Kanaly) and Baby Face Nelson (Richard Dreyfuss) while being pursued by FBI Agent or "G-man" (short for Government man) Melvin Purvis (Ben Johnson) who will stop at nothing to end Dillinger's reign of terror. During his travels, Dillinger also shacks up with Billie Frechette (Michelle Phillips). 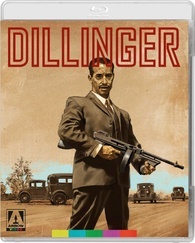 Dillinger gets my vote for being one of the most realistic crime films I've ever seen. The fights, falls, and the bullet wounds look so brutal and realistic and given Milius' almost news footage-like film making, it just adds to the verisimilitude. The cast is a dream come true for 70s cult film fans. Oates, Stanton, Lewis, Dreyfuss and The Mamas and the Papas' Michelle Phillips (who in my opinion is one of the most beautiful creatures I've ever set eyes on). Stuffed with some nice extras, Arrow's release is a must see for 70s cult and action film fans.